This makes a great baby shower gift or a table centerpiece. 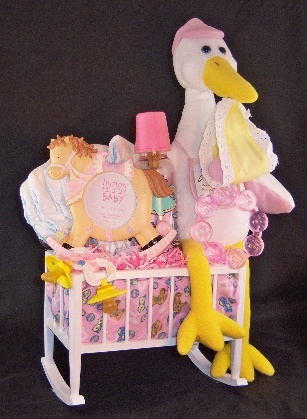 Stork doll with baby sitting on a cute baby crib. Also includes 6 diapers, a baby bottle with two wash cloths, a picture frame, a teething ring, and a set of pacifiers. Comes in blue or pink only.